BLURB: Two tarnished angels--a former priest and a former prostitute--risk their lives to save a baby from a beast-man's savage vengeance. 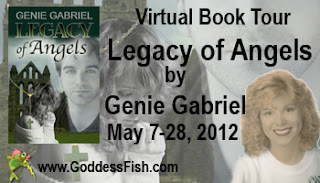 Can you share with us what Legacy of Angels is about and how you developed the story? 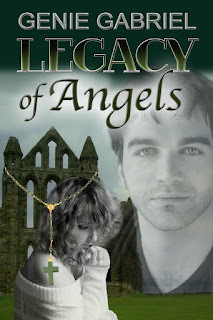 LEGACY OF ANGELS is the second book in my LEGACY series, and is about two tarnished angels--a former priest and a former prostitute--who risk their lives to save a baby from a beast-man's savage vengeance. My first book of the series had already set up a baby-selling ring. One child from this illegal ring had come into the custody of child welfare. 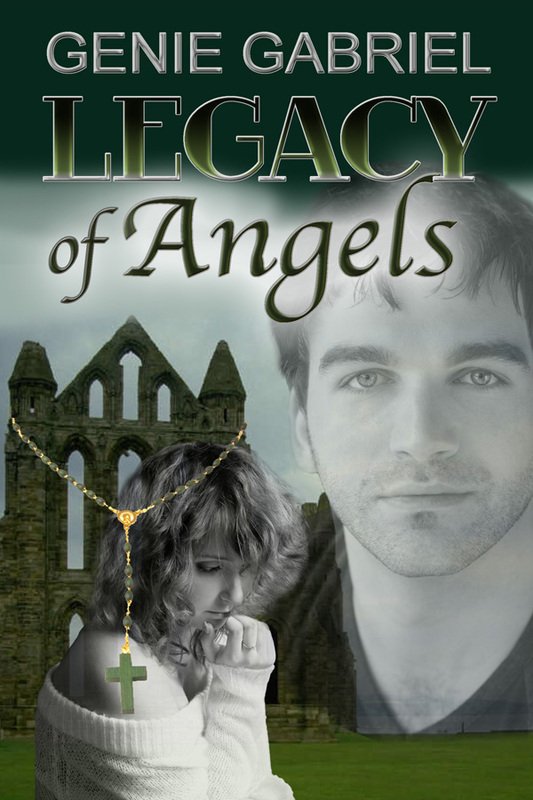 The caseworker heading the search for this baby's birth mother has seven overly protective brothers--one of them a priest, who is the hero of LEGACY OF ANGELS. This story has two main characters--a priest and a prostitute--can you share why you chose these two and what, if any, research you did when creating them? (I'm curious as to why these two types of people is all). I learned early in my writing career that conflict is good if you don't want a story that's only a few pages long. One of the ways I ensure conflict is pick two main characters who are seemingly opposites in many ways. For instance, a priest and a prostitute. Then I give them a mission where they are forced to work together for a greater good. In LEGACY OF ANGELS, that mission is saving the child. The journey to accomplishing that mission also forces the characters to confront their fears and past traumas, overcome those challenges, and become strong enough to accomplish their mission. And, by the way, earn a happily-ever-after. For Patrick, that challenge is a wrenching spiritual journey on whether or not to remain a priest. For Claudia, it is overcoming a childhood of forced prostitution to prove she can be a nurturing mother. As they make their individual journeys of growth, they also realize they can help each other heal. When developing any characters, I draw on my own emotions and experiences of friends, as well as read books and look through online and other media resources from a number of points of view. What is it about the power of the human spirit--in particular the troubling times--and how one may settle their conflict appeal to you when you're writing? I feel very strongly that good should triumph over adversity. A big part of my "real" life was spent working in a state social services agency. Many kids who experienced horrendous abuse continued down a path of self-destruction. Yet others overcame that trauma to achieve their dreams. Those kids fascinated and inspired me. Every time I write a story of triumph over incredible odds, I'm honoring children who have been abused. I want my stories to shine with the hope that, like these kids, anyone can become the hero of their own life. I've read you love dogs. Does this story have one? I have so many people in my LEGACY series, I tried to contain myself on adding pets too, so not everyone got a dog. A kitten seemed to fit Claudia better. People never really tire of angel stories plus there's something special about angels in themselves. Vampires and other supernatural creatures may be popular but how many people have had near death experiences with these creatures as opposed to the countless accounts of people seeing or interacting with some kind of angelic being. Do you have any thoughts on this? Angels or other benevolent spiritual beings often appear in my stories. Usually not the white-robed, winged beings popularly depicted--but sometimes. I present these beings as a possibility, and let people make up their own minds. I think most people want to believe in miracles. Angels symbolize that hope--that connection, if you will, that we are part of a higher good. Thank you, Reader Girls, for having me as a guest today! The land sloped downward where Patrick now walked, making it seem like he was disappearing. When only the top of his head was still in view, panic seized Claudia once again. "Wait!" She jumped out of the car and slammed the door behind her, running to catch up with him. She topped the knoll and stopped, her chest rising and falling rapidly with exertion and fright. Patrick stood looking up at her, the same serene expression on his face. Then he turned and continued walking to the water's edge. Hidden in the tall reeds was a raft that looked as if it would sink with the weight of the family of ducks swimming nearby. However, when Patrick climbed on, the craft barely dipped before stabilizing. He turned and reached out his hand in invitation. Cautious but curious, Claudia climbed aboard. Using a long pole, Patrick pushed them across the lake and under a rocky outcropping. He secured the raft to a sawed-off tree stump that served as a pier post for a make-shift dock and stepped off. "Be careful. It can be slippery." Intrigued, Claudia once again took Patrick's hand and climbed off the raft. They walked toward a sheer rock cliff topped by ruins of what could have been an ancient stone cathedral. However, as they reached the cliff, Patrick slipped through a notch in one of the rocks. Once inside, he retrieved a flashlight from a pocket in the rock wall and turned it on, revealing a narrow corridor. Claudia followed him down a winding pathway for what seemed like miles. Patrick walked without hesitation, turning down side tunnels until she felt totally disoriented. At last he stopped in front of a solid rock wall. Well, it appeared solid. Until he slid aside what must have been a doorway, revealing into a cavernous room. "Where are we?" Claudia asked. Patrick turned with a half-smile. "Safe. That's what you wanted, right?" About the author: For years I've been fascinated by the puzzle of why some people collapse under life's traumas and others emerge triumphantly stronger. These triumphs of the human spirit over the ugliest of adversities became the basis for my stories. Yet my dramatic stories have always contained touches of humor, and sometimes I have great fun writing romantic comedy novellas. However, in all my stories, my passion for writing romance is an outlet for the powerful messages that people can overcome great difficulties, and true love can turn life’s heartaches into happily ever after. Follow the tour and comment; the more you comment, the better your chances of winning! The tour dates can be found here. Conflict is essential to making a story great. A Priest & a prostitute - I can envision conflict a aplenty. Thank you for hosting Genie today. I believe in angels, and this story sounds awesome and full of surprises. I don't know...That seems scary where they went. It seems like you might naturally trust and follow a priest, but Claudia seems very brave to me--to follow him so blindly, not knowing where they were going, through rocky tunnels. With Claudia's background of abuse, you'd think she'd be more skeptical. It would be interesting to see what led up to this leap of faith on her part! I absolutely need conflict in most of my stories. It's what keeps the tension alive. So many different directions to go. The possibilities are endless! I don't read that many contemporary books. Most of what I read is historical romance, set mainly in the 19th century. So when I read about your book and the unusual combination of characters thrown together, well their chosen professions alone is enough to cause conflict let alone the externally caused conflict. Talk about a double whammy! This book sounds like it would translate well to a movie script. If your book was ever made into a movie, who do you see playing the lead parts? Hi, Karen! You have totally stumped me on who could play the lead parts if LEGACY OF ANGELS was made into a movie. (But I did spend some time online looking. LOL!) I'd have to throw that question out to others for suggestions and then have a movie marathon to see who most closely fit the ANGELS characters. Love your books! And especially Legacy of Angels. 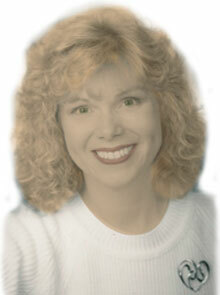 Hi, I loved your book, Genene! I definitely would have preferred a cute dog in the story! LOL, Vidya! I may be more of a dog person myself, but I'm a sucker for kittens too. :) No new pets in book #3 coming out in July, but book #4 in September will feature a rescued dog. Perhaps because a few rescue dogs have claimed me. I would love to read this one. I am a dog person myself but I want to get a cat when I move into an apartment. But cats in books don't cause allergies, so I can write about them! And the winner is: Karen H! Karen, please contact me at to claim your prize: a $10 gift certificate to Powell's Bookstore. CONGRATULATIONS! And thank you once again to Reader Girls for having me as a guest! Got email this AM from Genie telling me I won her daily contest! Thank you so much! The only thing more fun that a blog book tour is winning a drawing! I would love to read this! I love dogs also. Hi, Felicia! Thanks for your kind words. Dogs are easy to love, aren't they? Glad you stopped by, and will put your name in the drawing for the end-of-the-month prize!